Sora (ebook) Assignment - how to. Go here for Sora info/Help! While listening to an audio book listeners can create bookmarks and add a note. This works either in the App or on the Sora website as they both look and work the same. You CANNOT highlight text but can add notes if using an audio book. The recording on the right shows how to create a bookmark and note. This view looks the same across all platforms. Go to the home page and scroll down. Touch the book with the notes you need to turn in. At the top touch the "Upload Arrow" and select .pdf*. A new window (in Safari ?) opens with your document. Hit the upload button at the bottom and move the .pdf into your School Google Drive account. From there you should know how to get a file from Google Drive to your teacher. *If you use a PC you can log in to www.soraapp.com and it all works the same... 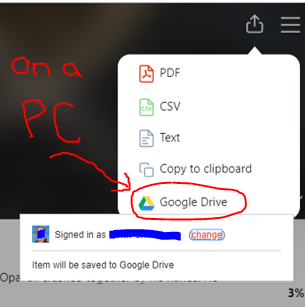 But there is a button to directly upload to Google Drive.